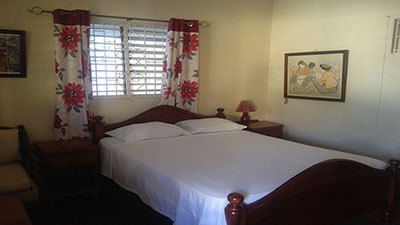 3 large double bedrooms and 2 bathrooms sleeping up to 8 people including children (maximum 6 adults). Perfect for a family or group of friends. 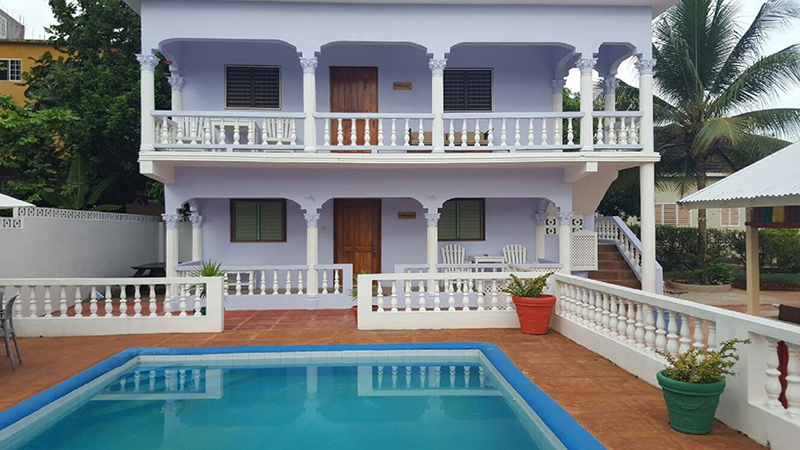 More spacious and built above Tamarind also perfect for a single person or a couple. 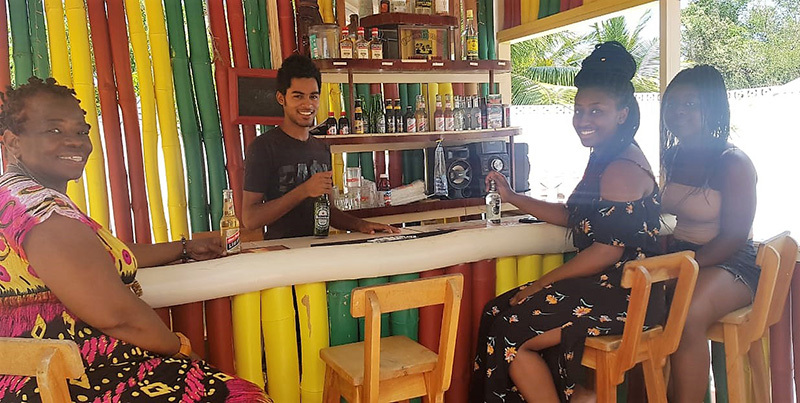 Whether your booking is for a single person, a couple or a larger group of family or friends you will no doubt be looking for that somewhere special to spend your time in Jamaica. 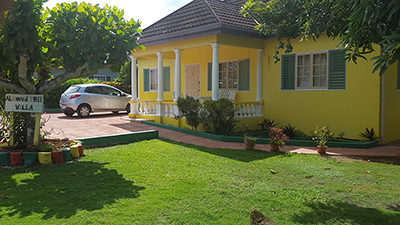 If you are looking for high standard, self-catering, rental accommodation close to Ocho Rios, you have just found the ideal holiday retreat. We offer everything you might possibly need for that perfect vacation at prices everyone can afford. 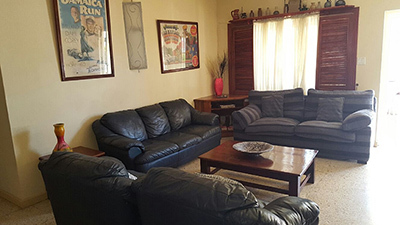 You will be staying in a very safe and secure environment in the quiet leafy neighbourhood of Eltham. Almond Tree Villa and the three studio apartments, Tamarind, Pimento and Cinnamon are situated together at the end of a Cul-de-sac within Selbourne Gardens which is an upscale private estate. Our security couldn’t be better with our attentive and helpful manager Chrishina living on site and always available. Additionally we have monitored CCTV surveillance cameras in operation throughout the property. Because the property is at the end of a no through road there is no passing through of any non-residents. The apartments are built at the rear of the villa around the pool in a very secluded area. We have had the property for over 25 years now and we have never had a problem with security. You will be away from the hustle and bustle of Ocho Rios yet only three miles and literally a ten minute drive into the centre of the exciting tourist resort. There are several really nice beaches within a few miles of the property. White River has a lovely beach and is only ¾ mile away. Mango Beach at Coconut Grove is a favourite with many of our guests and is also only a short drive away. James Bond Beach and the famous Dunns River Falls are also easily accessible and within a few miles. Always kept pristine and crystal clear the pool is a favourite with everyone, young and old. 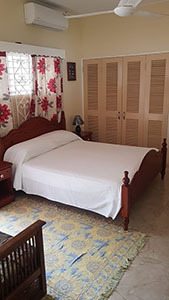 The Swimming pool and the pool terrace are in a private and secluded position being situated in the back garden and are only shared by the guests in the villa and the three apartments. We now have a small bar which is manned by Chrishina. 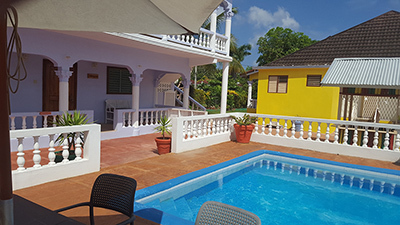 Our guests can spend their time relaxing and lazing around the pool on a sun lounger while sipping a cool drink or two or perhaps eating outside under the umbrellas on the picnic tables by the poolside. The pool measures 25ft by 15ft and is ideal for children being only 3ft deep at the shallow end where the steps enter and 5ft at the deep end. Children must of course be supervised by a responsible adult. You will find our staff always ready to help you get the most from your holiday. Please feel welcome to ask for any assistance with anything you need. If you need help with any small problem that might arise or if you need any advice, please speak to Chrishina or Junior. They will be pleased to assist you. Our driver Junior helps us oversee everything at the villa and you will find him a big help. 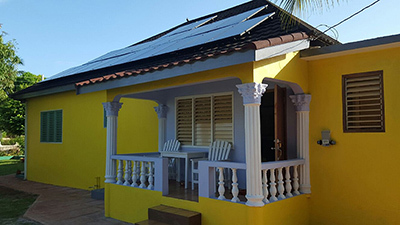 Our ‘Caretaker/House Manager’ Chrishina resides at the rear of the property in a self-contained apartment. 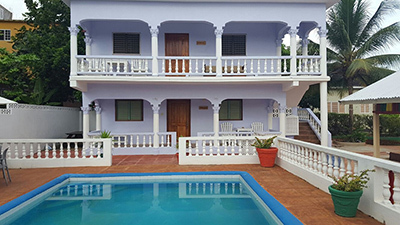 Chrishina maintains the gardens and the swimming pool and terrace to the highest of standards. Apart from security, which is one of his other roles at the villa he runs to bar and is always happy to serve you and ensure your holiday is enjoyed to the full. Breakfast or any other meal can be served on request. Chrishina can also organise some authentic jerking for you by the pool side. He has a jerk pan and with the bar open and serving a few cold beers and some nice music you can create a lovely vibe. The maid service is already included in the price of your holiday. Vida is responsible for our housekeeping and her pride is to see that our guests have every home comfort and everything they need. For stays of 7 nights or over we will arrange to come in roughly half way through your stay to clean and change towels and bedding. We offer airport transfer with our driver Junior from either Kingston or Montego Bay airports. Both airports are about 60 miles away but Montego Bay is a much easier drive and a cheaper option if you have a choice. Please ask for a quote when booking. You will find Junior’s prices for airport pick up to be the most competitive. Junior drives a Toyota Noah 8 seat bus and is always available to offer a very useful service to and from the villa. You will have his mobile phone number and you can phone him whenever you need a drive back from 'Ochi' or from the nearest beach. Junior is also an excellent tour guide with a wealth of knowledge of all things Jamaican. Please ask him for a quote to drive you literally anywhere on the island. We have Solar Powered Electricity which means we will never suffer from a power cut and we have hot water around the clock. Please do not waste energy unnecessarily. Please check fans and lights are switched off before you go out. It will be very much appreciated and it helps us keep our rates the most competitive. For security reasons and to be fair to all our guests we strictly do not allow any visitors on to the property other than the guests named and paid for in your booking.